On Thursday, 22 December 2016 two exhibitions opened at the Historical Museum of Serbia: “Serbia in 1915–1916”, and “The French-Serbian Military Hospital in Sedes, Thessaloniki”, a visiting exhibition of the Museum of Byzantine Culture Thessaloniki. The introductory words were given by the authors of the exhibitions: Dr. Dušica Bojić, Director of the Historical Museum of Serbia, Nebojša Damnjanović, Museum Advisor, Dr. Agatoniki Tsilipaku, Director of the Museum of Byzantine Culture, and Dr. Anastasios Antonaras, archaeologist. The exhibitions have been realized as part of the programme of celebrating the centenary of World War One, with the support and patronage of the Ministry of Culture and Information of the Republic of Serbia. Through archivalia, artifacts and photographs which have not been on display until now, the multimedia interactive exhibition “Serbia 1915–1916” strives to present in detail the suffering of the Serbian army and civilians and the importance of this period of Serbian history. The exhibition presents the events during 1915 and 1916, when, after the great victories achieved at the battles of Cer, Drina and Kolubara in 1914, and having proclaimed the liberation and unification of all unliberated Serbian and Slav peoples as her war goal, Serbia was not only faced with the typhus pandemic that spread across the country, but also with the diplomatic pressure from the Allies to give up her war goal, and eventually, from the beginning of October 1915, with a new attack from the numerous and technically superior enemy. Offering fierce resistance, especially in the defense of Belgrade, the Serbian Army, accompanied by tens of thousands of civilians, was ordered by the Government and Supreme Command to retreat southwards and westwards to the Adriatic coast, to meet up with the allies. This order was followed by an exhausting march across the craggy mountains of Montenegro and Albania, where many soldiers and civilians died from starvation and freezing. From there, after a series of appeals from the Serbian state leadership and at the request of the Russian Emperor, they were transported by Allied ships to Corfu. At the beginning of 1916, the island of Corfu became an island of salvation, but unfortunately also a place of death for the many sick and completely exhausted Serbian soldiers. The small island of Vido in front of the city of Corfu, and the depths of the sea around it, were called the “Island of Death” and the “Blue Sea Tomb”. 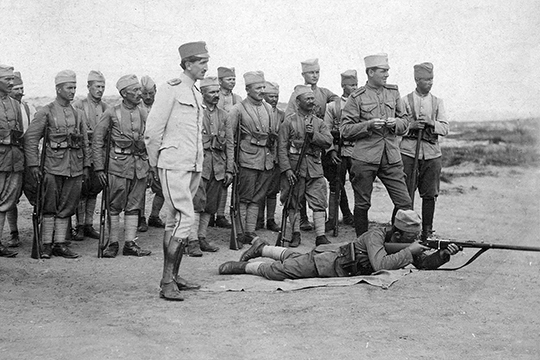 Corfu was also the place where the Serbian state administration continued its activities and from where the recovered army was deployed to the Salonika Front – the front on which the decisive victory was won in the Great War, making Serbian one of the most important victorious countries. The interactive installations that are part of the exhibition represent a modern approach to the suffering and heroism of the Serbian army and people in their resistance against the Central Powers. The realization of the exhibition was supported by the Military Museum, Belgrade, the Museum of Science and Technology and the National Museum in Čačak. The exhibition “Serbia in 1915–1916” has been supplemented by “The French-Serbian Military Hospital in Sedes, Thessaloniki”, a guest exhibition by Dr. Anastasios Antonaras and Dr. Ioannis Mocianosa, archaeologists of the Museum of Byzantine Culture in Thessaloniki. This exhibition includes rich photographic and video material, and original artifacts from the Historical Museum of Serbia. The exhibition represents the perception and presentation of the Great War in South-East Europe, more precisely on the Salonika Front, from the perspective of the common man. 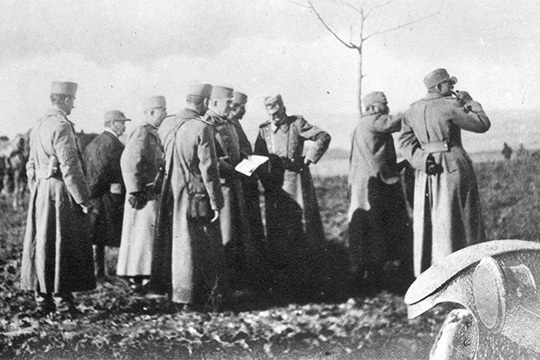 It was inspired by the discovery of a certain number of objects during the archaeological excavations in Thermi, formerly Sedes, near Thessaloniki, which were part of the equipment of the French military field hospital in 1916, and partly formed from the field hospital of the Morava Division. The excavated material evidence of hospital care of soldiers still remains to a large extent unexplored. However, the photographic documentation of the French Armée d’Orient indicates the connection between the objects found during the excavations at Thermi and the military field hospital, and provides important information on the preparation and storing of medicines, most often in the glass jars found during the excavations. Although they are mainly related to the treatment of the wounded, the archaeological findings from Thermi point to the key changes which Thessaloniki experienced as a result of the sojourn there of thousands of soldiers who had arrived to fight, and of the civil mission composed of scientists, which formed an essential part of the French Armée d’Orient. The arrival of the Allies in Thessaloniki and the establishment of many military camps in the marshy areas around Thessaloniki for the English, French and Serbs, caused inevitable changes in everyday life, habits, customs, and entertainment, and even in the appearance of an already multi-ethnic city. The changes, which reduced the average age of the local population and added to the variety which the city had acquired, were reflected on postcards from that period printed for the military in thousands of copies. The exhibitions were designed by Rastko Šurdić and Iva Jotić Lubura respectively, while the interactive design was created by Marko Todorovic and Marko Savic (authors of interactive contents at previous museum exhibitions, such as “Serbia 1914”, and “Pupin – from physical to spiritual reality”, and in the Serbia House in Corfu). The exhibition “Serbia in 1915–1916” is open until 31 October 2017, while the exhibition “The French-Serbian Military Hospital in Sedes, Thessaloniki” is on display until 6 March 2017. Guided tours for individual visitors are on Wednesdays at 5 p.m. and on Saturdays at 1p.m. (guided by Nebojša Damnjanović, Museum Advisor). Group visits should be scheduled by phone: 011 3287 242.